Screen rooms are a popular addition for homes in Hilton Head, South Carolina, and with good reason. Having a screen room installed allows you to make the most of your outdoor space, since you won’t have to worry about being pestered by insects, such as no-see-ums, or harmful UV rays. Plus, of course, you’ll have a shaded space where you can enjoy your yard all year long, even during the hot summer months. 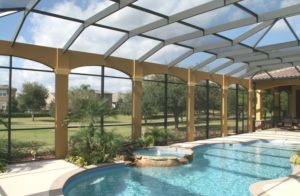 At Porch Outfitters, we install CAPEA (Classic Architectural Pool Enclosure Accents) screen rooms for Hilton Head, SC, homeowners. This is beneficial for our customers because it provides a cost-effective way for homeowners to get an enclosure that truly matches the architectural style of their homes. In the past, the choice was between basic enclosures that were mismatched with their residences or what amounted to a home addition that was costly and time consuming to construct. However, the CAPEA enclosure solutions that Porch Outfitters provides are custom-built by our team of experienced experts to perfectly match the architectural style of your home. We are one of only a handful of companies to adhere to the strict codes set forth by the Aluminum Association of Florida. We back the quality of our work with a lifetime workmanship warranty. For more information about the screen rooms that we can install on your home in Hilton Head, SC, contact Porch Outfitters today.